Loren Elliott/Getty ImagesOCTOBER 22: U.S. President Donald Trump addresses the crowd during a rally in support of Sen. Ted Cruz (R-TX) on October 22, 2018 at the Toyota Center in Houston, Texas. Cruz, the incumbent, is seeking Senate re-election in a high-profile race against Democratic challenger Beto O’Rourke. 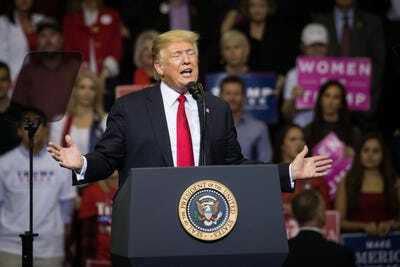 President Donald Trump appeared to criticise rate hikes by the Federal Reserve again on Tuesday. He quoted a Wells Fargo strategist who thinks a less hawkish central bank would help the stock market. The strategist initially thought the incident was a joke. In his latest move apparently taking aim at the Federal Reserve, President Donald Trump turned to a Wells Fargo strategist. “‘If the Fed backs off and starts talking a little more Dovish, I think we’re going to be right back to our 2,800 to 2,900 target range that we’ve had for the S&P 500,'” Trump wrote Tuesday on Twitter, citing Scott Wren, a strategist at Wells Fargo. Trump has repeatedly attacked the Federal Reserve, a move that breaks precedent and that could cast doubt on the independence of a central bank. With a humming economy, the Fed discussed increasing interest rates at a level that could slightly restrain growth at its September policy meeting. Trump directly blamed the Fed for a sell-off on Wall Street earlier this month and called rate hikes “ridiculous.” However, there is a consensus among economists and bipartisan lawmakers that increasing the cost of borrowing can be necessary at times to avoid overheating and high levels of inflation. In the hour following the tweet, Wren was the most-searched person on the Bloomberg Terminal. He said when people began reaching out to him about the president, he thought they were joking. Trump has also criticised Wells Fargo on Twitter. Wren said the president was “simply voicing his opinion,” but added he believes the Federal Reserve is and will remain an independent entity. “I do not believe that Chairman Powell or other Fed voting members are likely to be influenced by the President’s commentary,” he said. The Federal Reserve did not immediately respond to a request for comment.